Remember, projection screens are great for use at weddings, receptions, rehearsal dinners, anniversaries, homecomings and reunions to show video montages and misty, water-colored memories of the way we were. 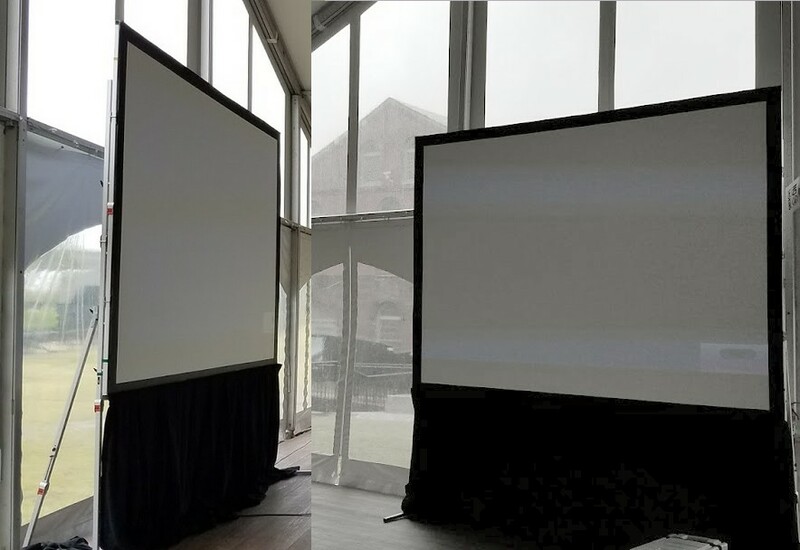 Call AVIVA Rental Systems at 804.353.9212 or toll free at 877-564-9143 or e-mail our Director of Events at doe@avivarentals.com to discuss your projection screen rental needs today! Rent projection screens for your office holiday party to project candid images of staff onto the screen throughout the event! Or, have a video camera project images of the actual party onto the screen or screens! 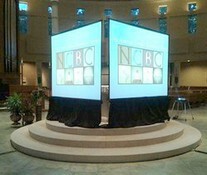 7.5' x 10', 9' x 12',10.5' x 14', 16' x 9' and larger Fast-Fold® screens with full dress kits (front or rear projection). 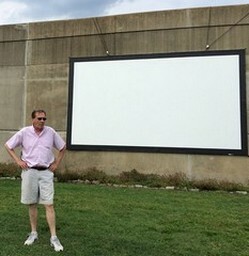 Outdoor projection screens for backyard movie nights! 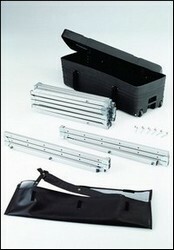 AVIVA carries 6'and 8' tripod screens for your projection screen rental needs. AVIVA also carries 10' and, 12' cradle screens. Cradle screens sit on the floor (or tabletop) on a cradle. The bars are raised from bottom up. Easy to setup and break down, these screens are a Matte White fabric.meeting. Uniquely designed projection screen lifts up and out of an aluminum case and is ready to use in seconds. 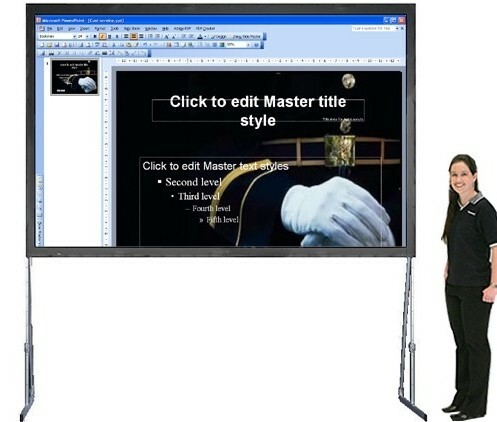 Lightweight and self-standing these screens are perfect for traveling and business presentations. AVIVA provides 7.5' x 10', 9' x 12' and 16' x 9' and 11'x20' Fast-Fold® Screens for front or rear projection screen rental needs. 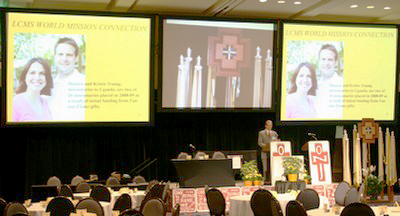 Fast-Fold® Screens give professional presenters the edge on the road. Available with complete drape and skirt accessories. All Fast-Fold® projection screens set up easily without tools. 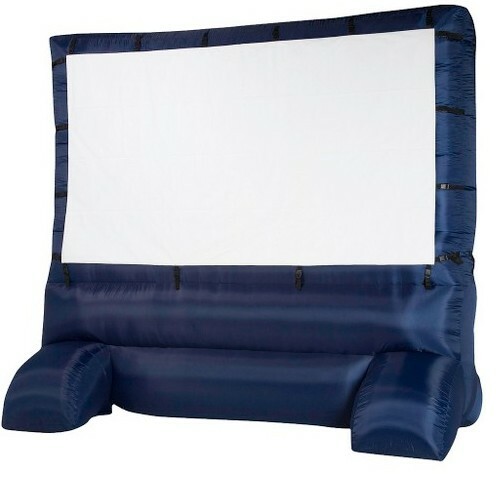 AVIVA Rentals also carries 18' (diagonal) inflatable, outdoor projection screens. Great for an outdoor movie night! Bring a little bit of the old-time, drive-in experience you loved as a child right to your own backyard! 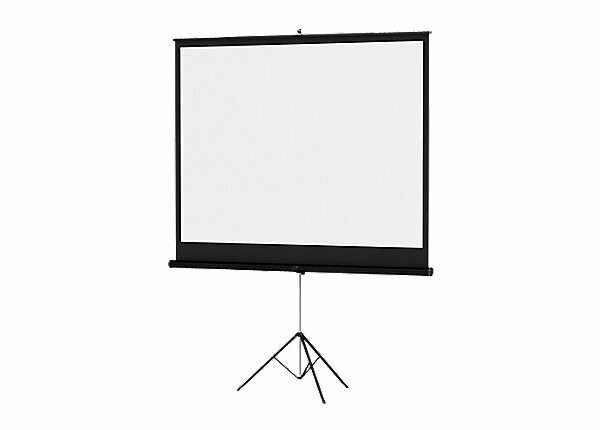 Click for more information about renting outdoor projection screens. Monoblox® is the mobile projection screen choice of the world&apos;s leading rental companies. So, of course you can find them at AVIVA Rentals. Monoblox® is a portable projection screen with an innovative one-touch locking system. Front, rear, and dual vision projection screen surfaces are available. A Monoblox® Kit consists of single-piece, aluminum frame with locking joints. Includes: 1 pair of T-legs and wing screws (for connecting frame and legs) and projection surface with 4-inch wide black border and snap fasteners. When determining what size projection screen to put in any event venue, as a general guideline, use the rules of proportion to help determine the screen size that will both look and work best in a room. Selecting the largest projection screen possible is not necessarily the best choice. Here are some things to consider regarding screen size. How far from the projection screen will the projector be? What size image will result? How far from the projection screen will viewers be? How high is the ceiling in the room you are using? In addition to our LCD & DLP® projectors and projection screens, AVIVA also carries 35mm, slide projectors, overhead projectors and Elmo document readers to cover any projector rental requirements you may have! Ask the sales staff at AVIVA Rental Systems about your projection screen and projector rental needs for your next conference or meeting presentation. Call AVIVA Rental Systems at 804.353.9212 or e-mail our Director of Events at doe@avivarentals.com today! 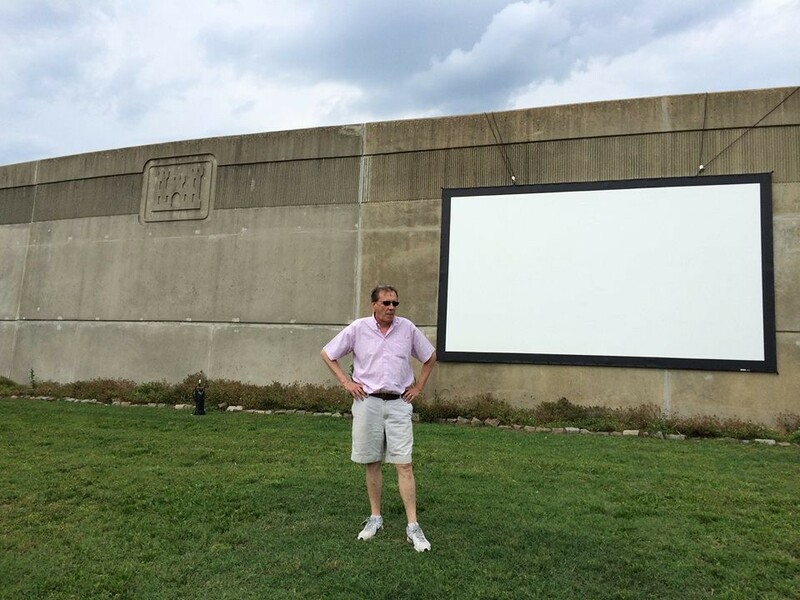 Projection screen at the Richmond Floodwall/Canal.